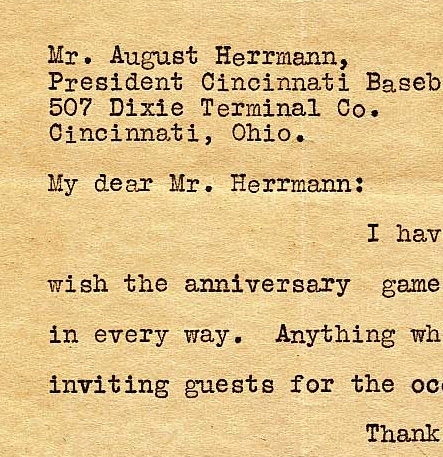 This letter addressed to Reds owner August Herrmann is believed to have been stolen from the National Baseball Library. -Clean Sweep Auctions has already sold several letters believed to have been stolen from the National Baseball Library in Cooperstown, NY, and with the offering of ”Lot 490″ in its current auction ending December 13th, it appears that history is repeating itself. The auction house is selling a letter written by Boston Braves owner Emil Fuchs to Cincinnati Reds owner and National Commission Chairman, August Herrmann. The letter appears to have originated from the Hall of Fame’s August Herrmann Papers Collection and was also sold previously by Clean Sweep back in 2009. -Steve Verkman, President of Clean Sweep Auctions has been notified on several occasions that letters written to Herrmann from NL President John Heydler, St. Louis Cardinals owner Sam Breadon and Emil Fuchs corresponded to similar documents in the Hall’s massive Herrmann Papers archive which contains over 45,000 documents and letters that Herrmann received during his career in baseball, which spanned from 1902 to 1928. The last document sold by Clean Sweep was a letter from Sam Breadon and was originally part of a file of Breadon’s correspondence to Herrmann from 1920 to 1926. -Clean Sweep and Brad Horn did not respond to inquiries about the Herrmann letter currently being offered for sale. 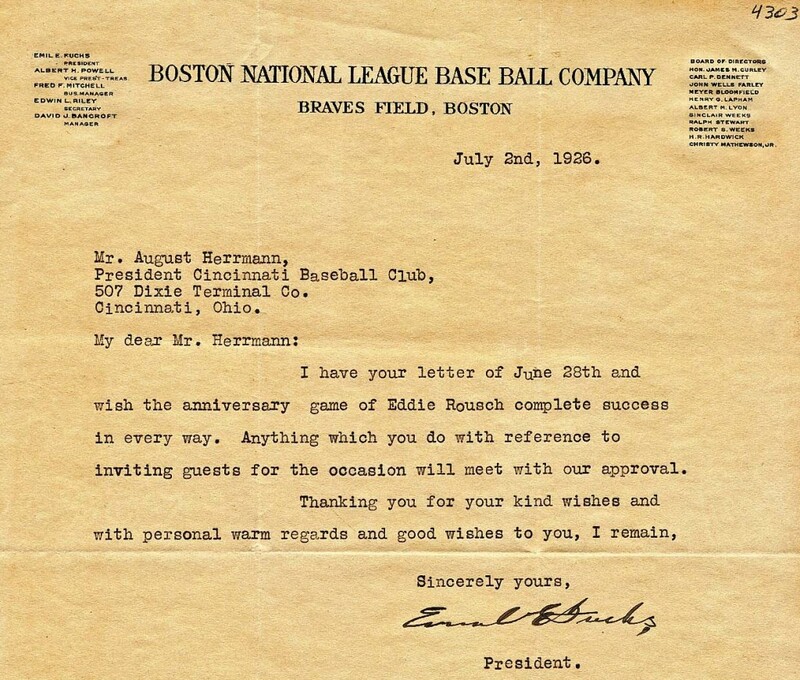 Unlike the Clean Sweep offering, these two letters written by Fuchs to August Herrmann are still part of the National Baseball Library's collection in Cooperstown, NY. –Jane Forbes Clark, the current Hall of Fame Chairman, and her predecessors have failed to properly investigate the considerable losses from the Hall of Fame collections and have also failed to pursue the recovery of property and prosecution of at least one known suspect believed to have been involved in the robberies, Mike Gutierrez, of Heritage Auction Galleries. In the late 1980s Gutierrez sold auctioneer Josh Evans a signed photograph of Babe Ruth that had a Hall of Fame accession number covered with white out. In 1998, an anonymous source told hobby newsletter The Sweet Spot that he had accompanied Gutierrez on a visit to the National Baseball Library and said of Gutierrez: “He would go to the photocopy machine, make copies of some of the documents; he made neat stacks of copies,” the witness said. “For every 10 items he’d take to the machine, however, nine originals would return to the file. One original would be mixed in with the copies and they would go directly into his briefcase. That briefcase would never leave his side.” The eyewitness also indicated that the documents Gutierrez was copying were from the Hall’s Herrmann Papers collection. -Hall of Fame officials have recovered several rare photographs stolen from the NBL including images of Mickey Welch, Christy Mathewson and Nap Lajoie offered for sale by Robert Edward Auctions, Mastro and Heritage. These recoveries were made only after Haulsofshame.com and Deadspin published reports illustrating that these photos had evidence of HOF ownership marks and accession numbers. The confirmation that these photos were stolen from the Hall is just the tip of the iceberg. 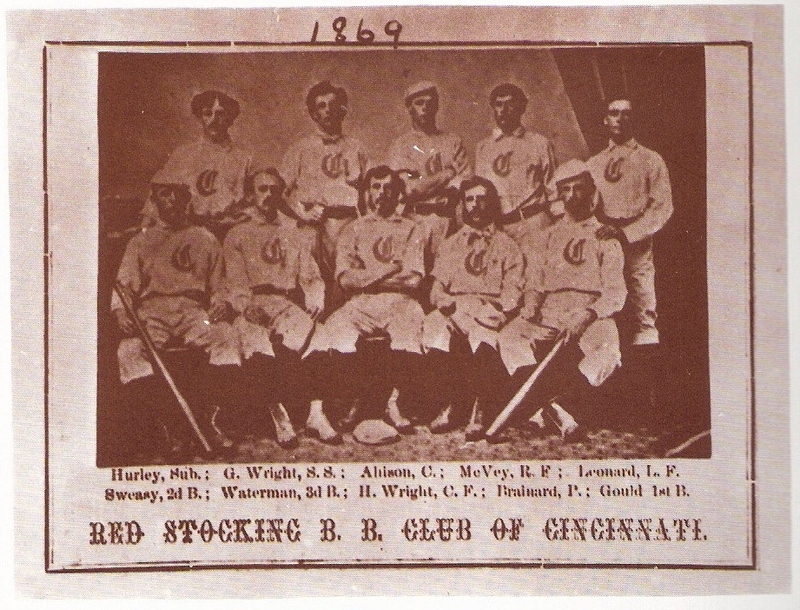 -Mark Rucker’s book Baseball Cartes (1988) included the Hall of Fame’s copy of the 1869 Cincinnati Red Stocking trade card by Peck & Snyder, but sources indicate that the rare card valued at over $25,000 is currently missing and believed to have been stolen from the NBL. Several copies of this same card have been stolen from the New York Public Library including one that was recovered at this years National. The letter being offered by Clean Sweep originated from the files of August Herrmann, now housed at the NBL in Cooperstown, New York. 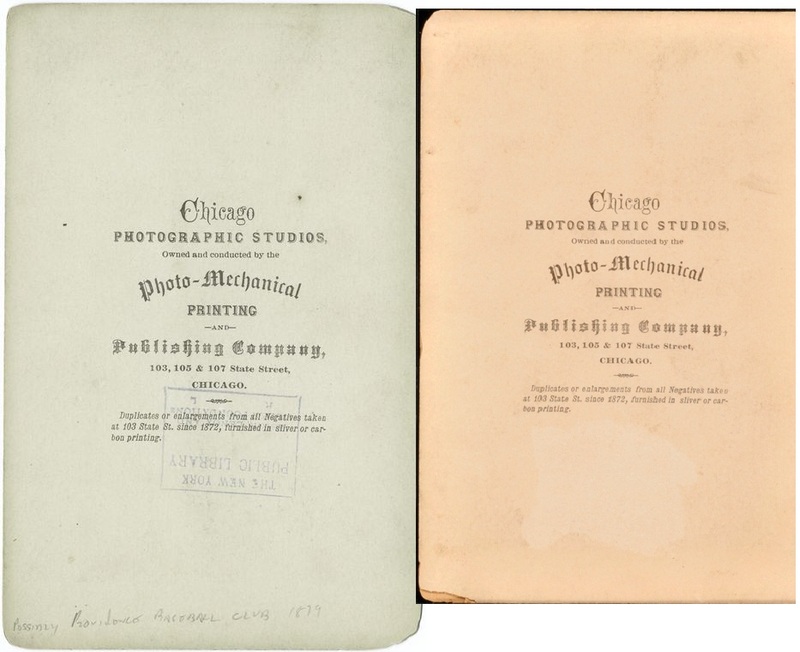 -Legendary Auctions‘ current sale includes a few suspect items that may have originated from the New York Public Library’s Spalding Collection including a MacIntyre cabinet of Harry Wright and an 1882 cabinet photo of the Providence Base Ball Club. The library has multiple copies of the 1882 cabinet- all stamped on the lower portion of the card’s reverse. The location and size of the paper loss on the reverse of the cabinet being offered by Legendary suggests it may have an NYPL provenance. -A Kalamazoo Bat cabinet photo of Charles Bastian and Denny Lyons also being offered by Legendary fits the description of many other missing NYPL items but appears to be one of only three Kalamazoo Bat cabinets of Philadelphia Nationals players legitimately in private hands. These three cabinets bear no NYPL marks or identifications and originated from the collection of the late hobby legend Don Steinbach. Besides these three examples of Bastian/Lyons; Fogarty and Clements, we know of no other cabinets of Philadelphia National players that did not originate from the NYPL or Baseball Hall of Fame collections. -Harry Wright donated all of his personal photographs to the National League before his death and they ended up at the NYPL in 1921 as a donation from the widow of A. G. Spalding. Missing from the collection are several MacIntire cabinet portraits of Wright. 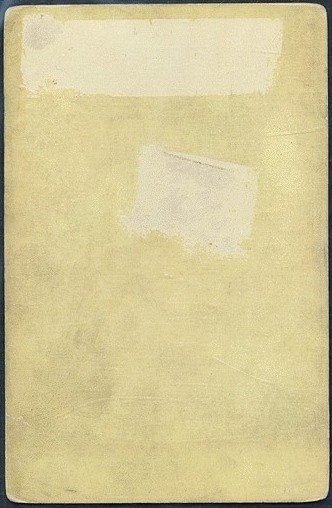 The paper loss on the reverse of the current Legendary offering is suspicious, but not as definitive as the example sold by Robert Edward Auctions (REA) in 2009, which exhibits the removal of the NYPL stamp and handwritten numeral originally placed in the upper left-hand corner. That same Wright cabinet was also sold by Barry Halper at Sotheby’s in 1999. This MacIntire cabinet photo of Harry Wright sold by REA in 2009 exhibits tell-tale evidence of the removal of NYPL ownership marks and identifications. -Pud Galvin signatures are extremely rare and only two authentic examples are known to exist on letters the hurler wrote to an executive of the Buffalo Bison Base Ball Club in the late 1870s. Both of these authentic signatures are utilized as exemplars in Ron Keurajian’s new autograph handbook published by McFarland. Schrader, Guinness and the St. Petersburgh Museum of History should pick up a copy of the book and educate themselves on the subject of HOFer signatures. It would save them from exhibiting forgeries to the general public who are also being solicited to contribute funds for a permanent exhibit at the museum in the future. As it stands, the collection also includes forgeries of Babe Ruth, “Shoeless” Joe Jackson and many others. UPDATE: Bill Mastro Will Plead Guilty to Fraud: Former auction heavyweight, Bill Mastro, has agreed to change his not-guilty plea to a plea of guilty, according to the the United States Attorney’s office for Northern Illinois. Great info. I have always been suspect of the “Little Cooperstown Collection”. I am just happy that someone is finally bringing this to the public’s attention. No reason anyone should profit off of the display of terrible forgeries. Does nothing but bad for the hobby. Whoever sold that Pud Galvin ball to Mr Shrader should be giving him a refund. 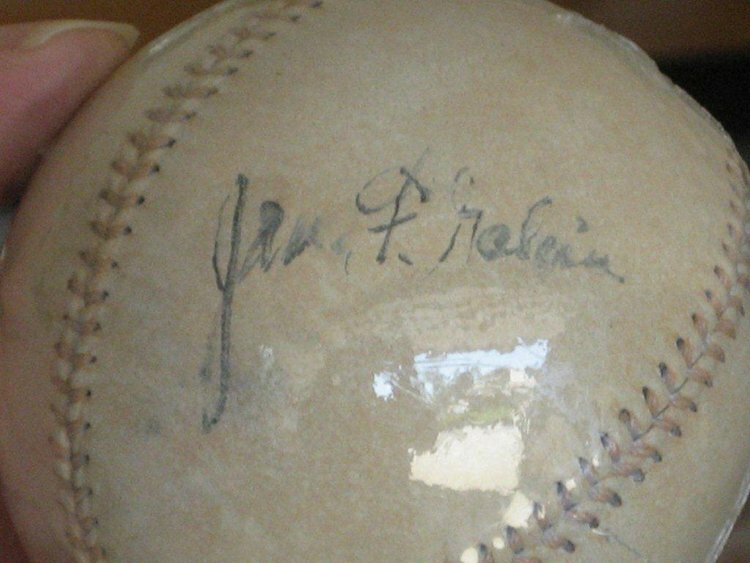 What a joke that ball is, it looks like its signed on one of those modern day reproduction balls for vintage play. Yes great reporting. Sad to read of esteemed personalities in the baseball autog hobby – business may not have been honest or trustworthy. Innocent until proven guilty yes but evidence is compelling as presented. Then again, how could anyone buy that ball and not think that it was a fake? Bill Mastro’s reported decision to plead guilty to trimming the card is interesting to say the least. In general, plea agreements are about compromise with each party giving up something in order to gain something they feel is favorable to their side or position. If it becomes a legally accepted and acknowledged fact that the card was trimmed, then this may change the potential fortunes (fiscal and futures) of any number of individuals. In my estimation, this potentially opens the door for subsequent prosecutions of others who were involved in the act or conspiracy to defraud the collecting public based on their own actions as they relate to prior knowledge of this fact and their benefit from it. The reported Bill Mastro plea, once consummated, could turn out to be a watershed event for the hobby/industry in that it then potentially opens the floodgates to be the person or persons to cut the next best deal with Federal prosecutors, if they are so inclined to accept. The sports memorabilia field is fairly small and insular community at the industry management levels, with many individuals having long standing personal and business relationships with each other…and with this comes the knowledge of their personal and business dealings related to this card and other issues currently said to being under investigation. Regarding Dave’s comment above: In theory, I don’t disagree with you…but…wasn’t the other key player with the Wagner card deals Bruce McNall? He has already done time in the cooler for misdeeds relating to his hobby (mostly coin) business. I don’t know how much more the feds could or would want to get out of him. Please know I am not an advocate or champion of Mr. Mastro, but my point is when things like this start to unravel, I suspect the best deal to have made is the first one…everyone after that will have less to offer on the guy who made the previous deal; bringing with it a heightened sense of urgency as to who else is being looked at and what they may have to say or offer on them. What does this mean for PSA? Cant be good. What this means for PSA is going to largely up to them. By that I mean in the coming months, there may be additional information detailing their actions (good or bad, individual or organizational level) as it relates to this card and other issues. As such, they should expect to a see symmetrical response from the industry and collecting public one way or another. In my mind, the bigger question for PSA is what, if anything, they can do to protect/preserve the brand name and their place within the 3rd party authentication/evaluation industry. The one advantage they currently have is volume and sunk cost on the part of the collecting public. For the collecting public to holistically throw off PSA writ large will impact the individual collectors who are heavily vested in their product line. If PSA does nothing, then over time their place in the industry will likely atrophy to the point of irrelevance as the collecting public will likely simply migrate to a less contentious brand name for the same products/services. Is this the beginning of the end for Cooperstown? This is typical for Steve Verkman and CS Auctions. His material has been suspicious for many years as well as his customer service. Never have I seen someone who shouldn’t be in a people service career. His knowledge is suspect and his morals are lacking. Definitely not one of the good dealers of the many in this hobby.